Hi everyone! Okay, this is one of my favorite dishes. 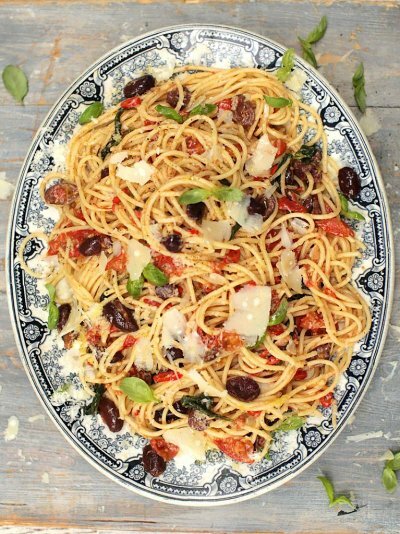 As you all know, I am a huge Jamie Oliver fan (as is my Jaimie) and this is one dish that has been a huge hit with everyone. If you are seeking a meat-free night once in awhile, this is a great option. 1. Boil pasta according to package directions (it is a bit different for gluten-free than regular). 2. While pasta drains, heat up oil then crush garlic and throw it in for about three to five minutes. 3. Take out garlic then put tomatoes in garlicky oil mixture until the tomatoes start to have the consistency of a chunky sauce. 4. Add olives, cooking about 5 minutes. 5. 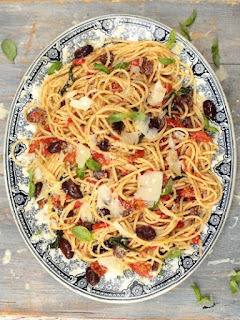 Once olives are softened, turn heat off then add pasta, nutmeg and feta. (I usually add more because we are feta fans here but it is up to your own taste). Give a big stir then add a Greek salad or garlic bread as a side.